Good morning! I don't suppose you're quite acclimated to the time change, I'm not. Sunday seemed like the day that lasted forever, although I don't really know why. It's just an hour, but it's like the hour that never ends! I didn't notice the darkness so much Sunday, but today when it gets dark early the time will stretch on into eternity while I wait for Bret to get home for dinner. But luckily by the end of the week it will seem like the usual thing. Anyway, nice weekend. It was Bret's birthday Saturday and Frankie came home to celebrate. Always fun to spend time with her. I didn't sew at all, but I did manage to get this Splendid Sampler block done Friday. 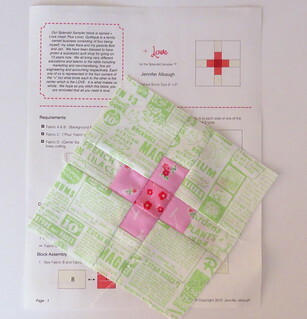 This block is by Jennifer Albaugh from Quiltique. Super cute, and super easy which was what made it a no brainer choice for me. Early on I decided that I wanted to do 16 blocks out of the hundred. Then I upped the game to 25. I've had 24 blocks done forever. I chose mostly the easy ones and I'm cool with it. I realize I have my limitations and I really wanted to finish this. I truly believe that it's a great opportunity to try new things, like paper piecing or applique or embroidery. I'm JUST TOO LAZY TO DO IT. So that's done. This week I've crossed off pick last Splendid Sampler block and make it from the list and added pick sashing and finish quilt. Maybe I should have broken that into several steps so that I'd have the joy of crossing something off more often. We'll see.. the list is in pencil and I have a nice eraser. Hope you guys have a great week. i love how you keep increasing the number!